Hosting my next “homegate” just got easier with Farm Rich and Litehouse, who sponsored this post. P.S. Don’t miss your chance to enter for the chance to win with Farm Rich. Giveaway details are below. Oh, how I love game days — no matter what team is playing or what team ultimately wins. For a person who has honestly never had a “favorite” team, my enjoyment comes from the excitement that surrounds the game. Not only are the games fun to watch, but the food (yes, the food is major) can take any sports gathering to new heights. And that’s why it’s so important to combine great food with any game day. 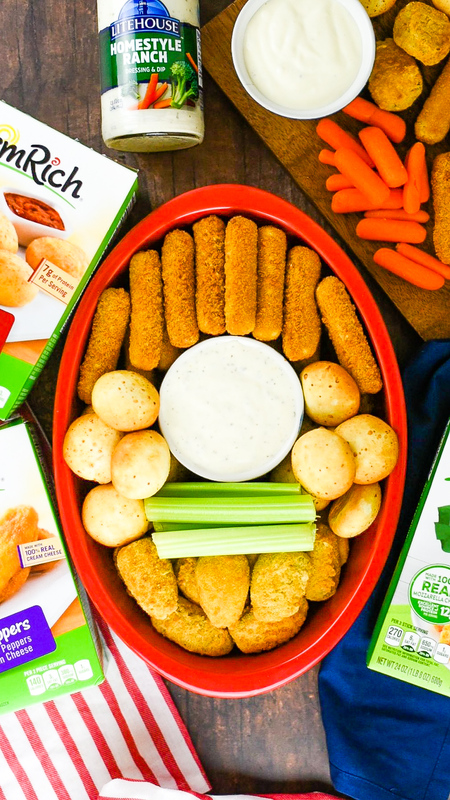 The perfect game day spread! When you’re not able to make it out to the stadium for a traditional tailgating experience, you can bring the party to your front door with “homegating,” always my party of choice. Enjoying great food, snacks and refreshments with friends and family in the comfort of your own home? It really doesn’t get any better. And for me, the key to a successful “homegate” are tasty snacks that are easy to pull together, serve, and refill. 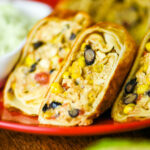 Since game days can be hectic who wants to spend a huge amount of time in the kitchen preparing appetizers? Not me, and I’m certain you feel the same. 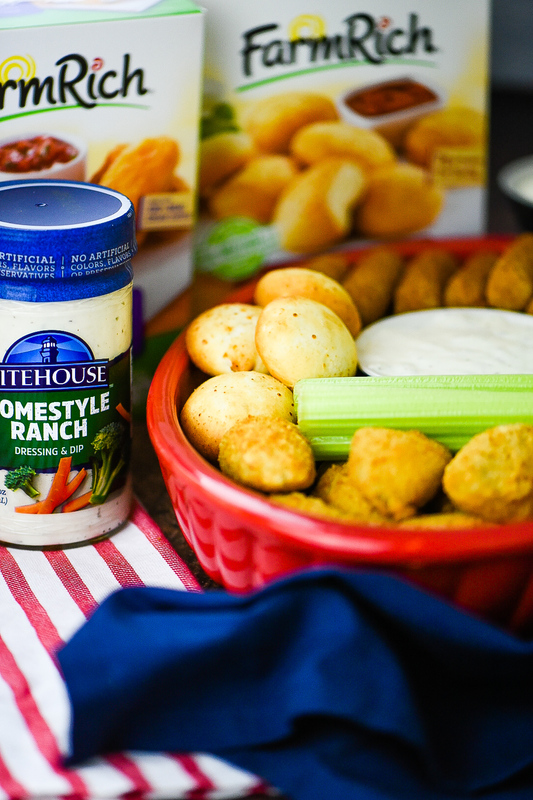 Well, say hello to Farm Rich snacks and appetizers and Litehouse Dressings & Dips… The way to make any “homegate” go smoothly — and deliciously. 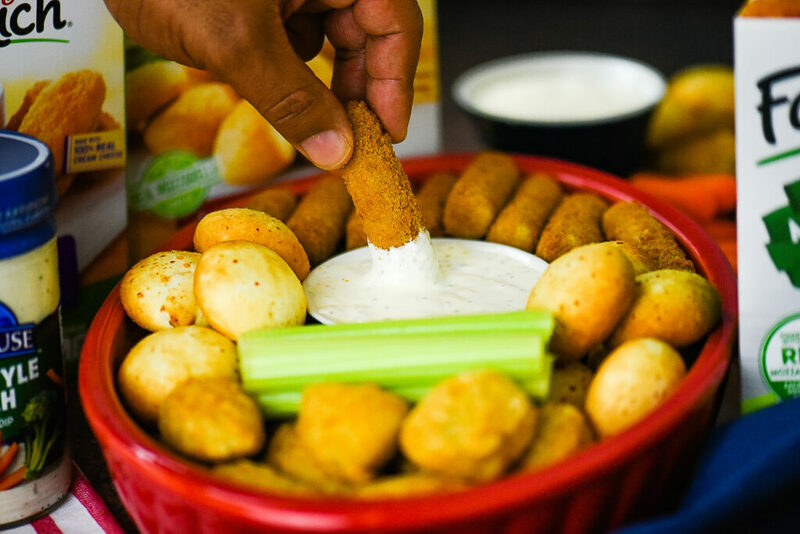 Available in most U.S. grocery stores in the freezer section, Farm Rich makes products like Mozzarella Sticks, Jalapeño Peppers, Loaded Potato Skins and Meatballs. Their products can be prepared in just minutes, some in the microwave, but there are also options to bake or fry. So, I headed to my local Kroger grocery store for my homegating extravaganza to pick up some awesome game time snacks and dips. With cheese on the brain (and a crowd favorite), I knew exactly what I wanted. 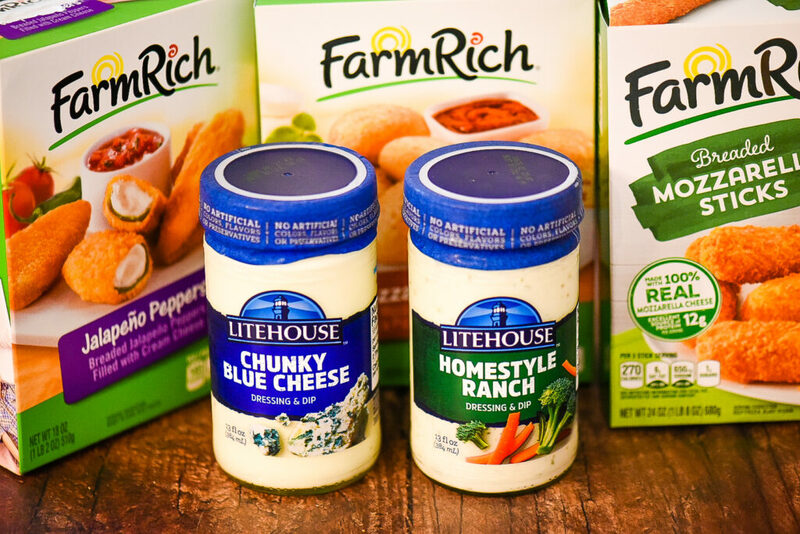 Farm Rich has a great variety of appetizers that pair perfectly with a side of Litehouse Homestyle Ranch Dressing & Dip or Litehouse Chunky Blue Cheese Dressing & Dip for your creamy dipping pleasure. These fresh-tasting dressings are the perfect complement to any appetizer from hot wings to fresh veggies to Mozzarella Sticks and more, and can be found in the refrigerated produce section of your local grocery store. Plus, they are gluten-free, and don’t contain high fructose corn syrup or artificial flavors, colors, or preservatives. These Farm Rich snacks and appetizers are super easy to prepare and all you have to do is follow the cooking instructions for each product and they are ready to go. 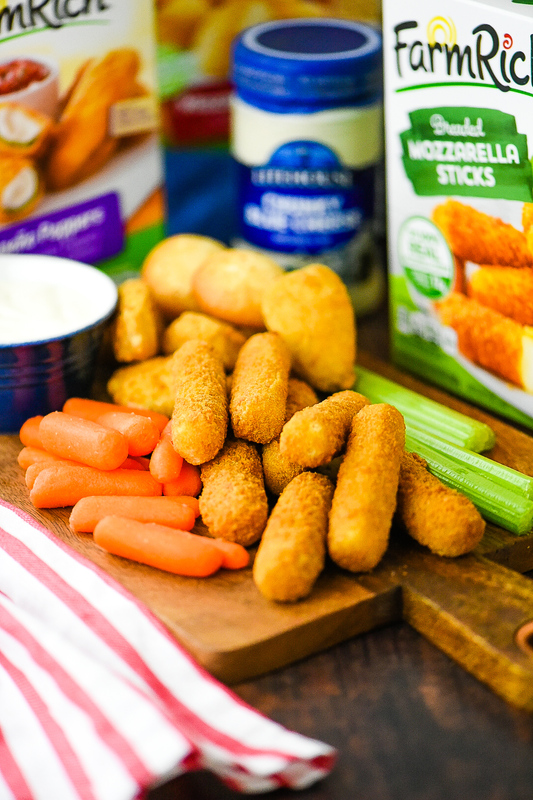 Whether you’re snacking on some Farm Rich Mozzarella Bites or dipping fresh celery into your Litehouse dressing of choice, everyone is sure to get their taste buds satisfied. 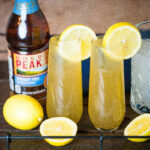 Farm Rich and Litehouse are teaming up for a special Homegating Giveaway! Prizes will include a 40” TV, Game Day Party in a Box, Farm Rich and Litehouse product coupons, and a VISA gift card to complete your party spread. Click here for the giveaway official rules. Click here to enter for your chance to win! This is a sponsored post written by me on behalf of Farm Rich and Litehouse. All opinions expressed are my own.